Ashaway, RI — Ashaway Racket Strings has extended its well-known Crossfire® line of hybrid tennis strings to include its increasingly popular 100% Zyex® monofilament strings. Additions to the line include Crossfire ZX, which combines Ashaway’s 17 gauge braided Aramid/PTFE Kevlar® +Plus mains with MonoGut® ZX Pro cross strings; and Crossfire ZX Tour, which includes Ashaway’s co-polymer string, MonoGut Original, mains with MonoGut ZX for the crosses. Crossfire ZX is the lighter of the two hybrids, combining 1.25 mm Kevlar +Plus mains for superior durability and control with MonoGut ZX Pro crosses. 17 gauge Kevlar +Plus is a blend of braided Aramid and silky soft PTFE fibers that softens the string’s feel. The 1.22 mm MonoGut ZX Pro is a 100% Zyex monofilament that has the closest dynamic stiffness to natural gut of any synthetic string and sets the benchmark for soft power and spin. For heavier hitters is Crossfire ZX Tour. This hybrid utilizes 1.27 mm MonoGut Original co-polymer monofilament strings in the mains for excellent durability and enhanced spin with 1.27 mm MonoGut ZX for the cross strings. This 100% Zyex monofilament maximizes power and improves the feel of the ball. The Crossfire ZX Tour hybrid allows players to experience similar playability and performance to the co-polymer/natural gut hybrid that is so popular on the tour, but with the extra advantage of optimum durability. 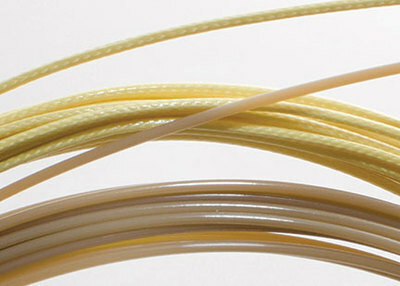 Ashaway Racket Strings are made by Ashaway Line & Twine Mfg. Co., the only U.S. manufacturer of string for squash, tennis, racquetball, and badminton. Operated by the Crandall family since 1824, Ashaway has been making racquet strings since 1949, and is responsible for several important technical innovations. Ashaway has been the Official String of USA Racquetball for more than ten years and has recently been named the Official String of the Professional Tennis Registry. Ashaway Line & Twine Mfg. Co. also makes braided products for medical and industrial applications. For more information visit ashawayusa.com. Zyex is a registered trademark of Zyex Ltd.